Offering you a complete choice of products which include glass railing bracket. 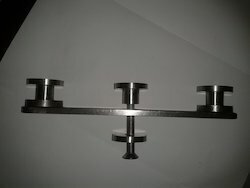 Glass railing bracket or glass patti bracket available in stainless steel 304, 316 anti corrosive material. It is also available in stainless steel commercial 201 grade and as per customer requirements. Sizes avaialble from 4 to 10 inches and also customized. Looking for Glass Railing Bracket ?